CL2x2 - Slip 3 sts to cable needle, p1, k1, p1, k1 from left needle, k1, p1, k1 from cable needle. Alternate increase and even rounds until there are 26 sts on each needle, 52 total. Increase round: K1, m1, knit until one stitch before end of needle, m1, k1. Repeat on second needle. Slip one stitch from needle 2 to needle 1. On all rounds, knit all stitches on needle 2. Work 8 rounds: *K1, p1*, repeat from * to * to final stitch, k1. *K1, p1*, repeat from * to * 7 total times, CL2x2, *p1, k1*, repeat from * to * 4 total times. Work 10 rounds: *K1, p1*, repeat from * to * to final stitch, k1. I recently discovered that Canadians call hoodies "bunny hugs". As in, newspapers could read "Roving bands of teenagers, dressed in sagging pants and bunny hugs, broke into the local gas station". O, Canada. I've never met you, but I love you. This hat is uber girly. It's made from 100% alpaca and is a baby pink. Softest yarn and the softest color. So what else could I do than put it on my baby nephew? I think this hat would be super cute in brighter, funner colors. But, maybe the world needs a few more super soft, baby pink hats. This hat is worked top down. M1 - Make one using the increase of your choice. I knit one in front and back. With the white yarn, cast on 2 stitches onto each of two of the DPNs (4 total). Join to work in the round. Round 1 and all odd rounds: Knit all stitches. Round 2: M1 in all sts (8 total). Spread the stitches across 4 dpns, so you have two stitches on each needle. Knit even until work measures 5" (5.5") from crown. Bind off 20 (24) stitches. This is the front of the hat. Work 6 rows of stockinette on the remaining stitches. 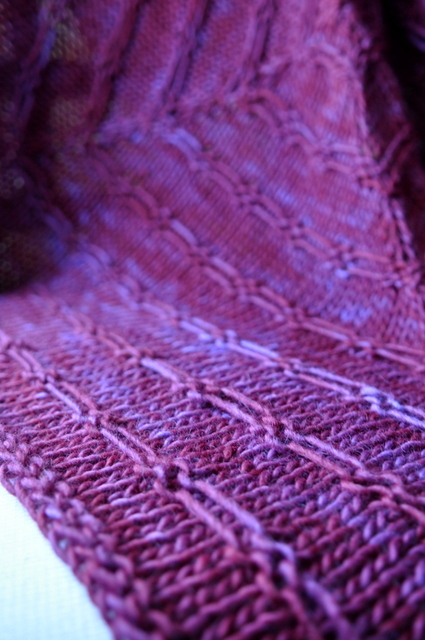 Bind off until 3 sts remain. Work an i-cord until it is 9 inches long. Break yarn, and weave end through remaining sts. Transfer the remaining stitches onto the needle for the other ear flap. Set the body of the hat aside. With contrasting color, create a 9" i-cord. Join to hat next to one of the existing i-cords, and knit on an i-cord along the edge of the hat (tutorial here) until you reach the cord at the end of the opposite flap. Work 9" of loose i-cord. Break yarn, and weave end through remaining sts. Repeat to create an i-cord edging across the other side of the hat. Block hat to 7.25" (8") wide and 8.5" (9") from crown to the tip of the earflaps. Make two pom-poms (here's a tutorial), and sew one to the end of each i-cord braid, securing the braid together. Once the wheels touched down from our honeymoon, it apparently made it officially okay to ask when kids will come. Not for a long time, people. Until we decide that sleep is for the weak and disposable income is for the shallow, other people's kids will do just fine. A lot of living can be done vicariously. I highly recommend it as a time management technique. Scratch the baby itch by snuggling with a nephew or listening to the sleepless horror stories of a new mom. Travel with no threat of food poisoning by flipping through your high school nemesis' Facebook pics. Enjoy an amazing career with none of the late hours by watching any of the new entrepreneur reality shows. Vicarious living is all upside without all that pesky hard work and failure. So, here's a new quilt to welcome a new little one to one of the cutest families I know. May he bring joy and delight to your lives, and to the lives of all those living vicariously through you. And, uh, please don't hold it against me that I posted this on the internet before giving it to you. I have no patience. Cut each created strip down in 3.5" pieces, creating blocks that are 3" x 3.5"
Sew block A to the matching color block B, so that the colored portions are touching. Lay out the blocks to create the zig zag pattern. Starting at the top left of the quilt, create a column of six blocks. Keep an eye toward making sure you use each color before repeating. If you want to have the color ordered differently, it will likely alter the number of blocks needed of each color. 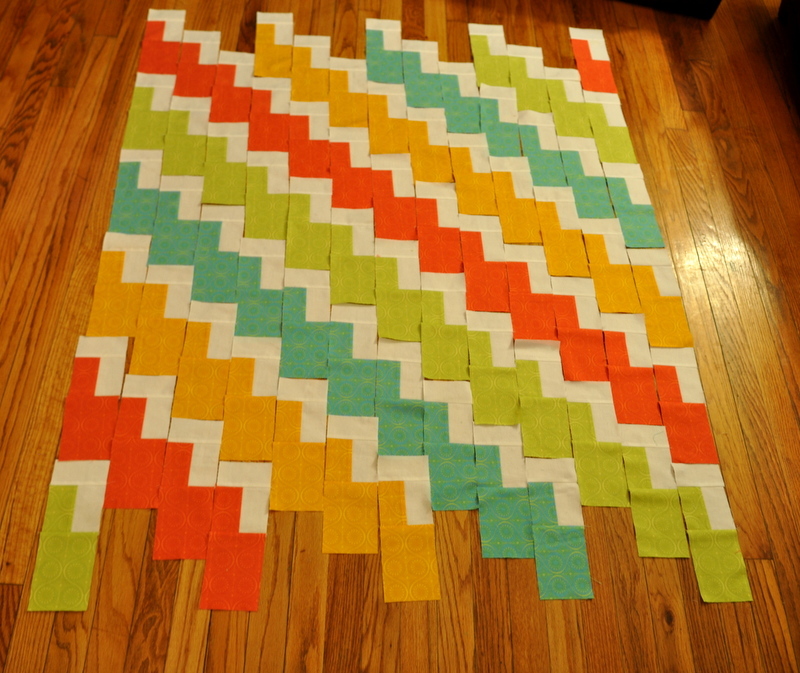 Lay out the second column while keeping the colors in order and lining up the white zig zags. There will be gaps at the top and bottom of every second and third column. Go back through and fill in the gaps with the remaining blocks. You will trim off the excess, so this is a good place to use mistakes, or only partially completed blocks. 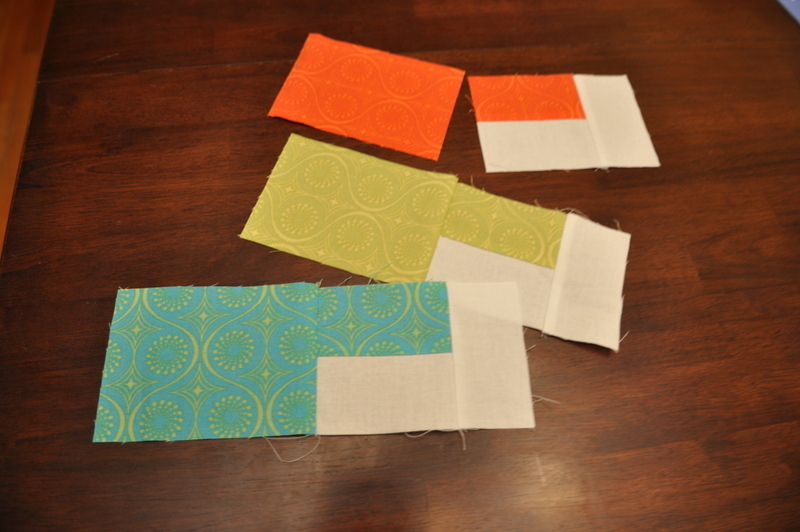 Sew the blocks into the strips. Press the seams very well. Pin the strips so that the white zig zags line up, with the bottom of the horizontal white strip aligning with the bottom of the vertical white strip to its left. This can be a bit tricky, so double check that it looks right before sewing. Press all seams very well. 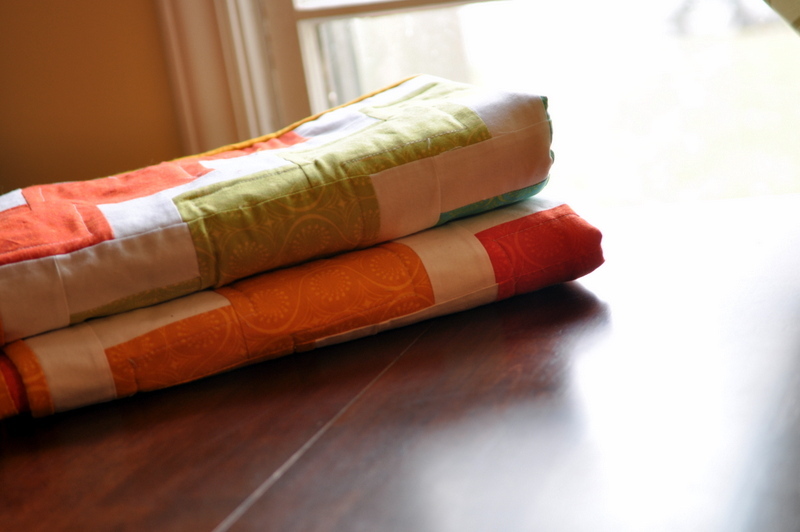 Trim the top and bottom of the quilt, so you have a straight edge. Back, quilt and bind your piece.